Ovas Taryn Randle and Maryann Aguirre speak with the crew working on the documentary about the group. 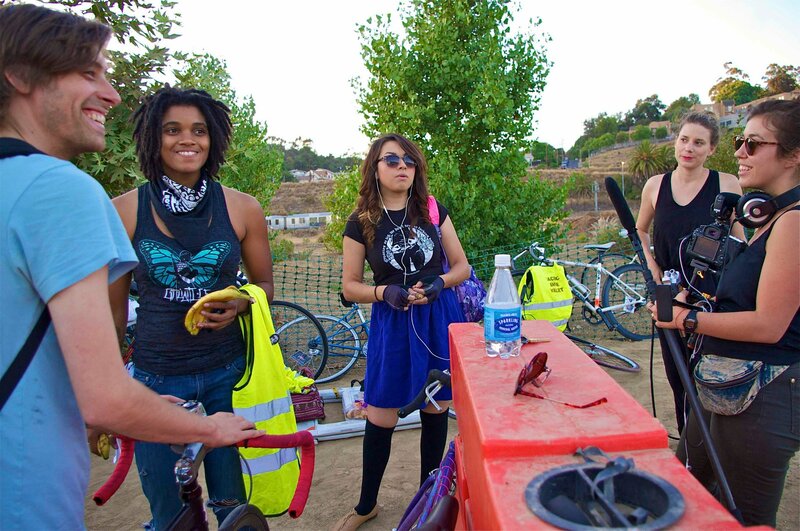 Sahra Sulaiman/Streetsblog L.A.
Fortin’s exploration of the life challenges that had brought the womyn together and the sisterhood that grew from cycling and reclaiming the streets as a group elicited cheers from readers here and around the country. Then the Ovas decided to hold a “Clitoral Mass” bike ride to celebrate their two-year anniversary and some folks lost their damn minds. While the idea of carving out space for womyn and womyn-identified folks — particularly those of color — who don’t feel their experiences are validated or welcome in other cycling spaces is not terribly controversial right now, conversations around equity, inclusion, and the mobility of those on the margins had yet to really take root in the livable streets movement. So, the idea of a female (identified)-centric ride caused a bit of a stir. The Ovas were accused of exclusion by some and of misandry by a (thankfully) small minority of disgruntled men. Some of the critics threatened to show up and crash the ride. A few even took it upon themselves to organize a counter-balancing ride for “Brovarian Psychos,” where those poor and oppressed (and grammatically-challenged) souls seeking to promote “man-ism, jism, mens’ rights, reform of family court, selective service, anti-male stereotypes, to counter-manginas and white knights, and restore balance to the force” could finally feel supported. Despite all the foolishness, the Ovas’ first event went off peacefully. 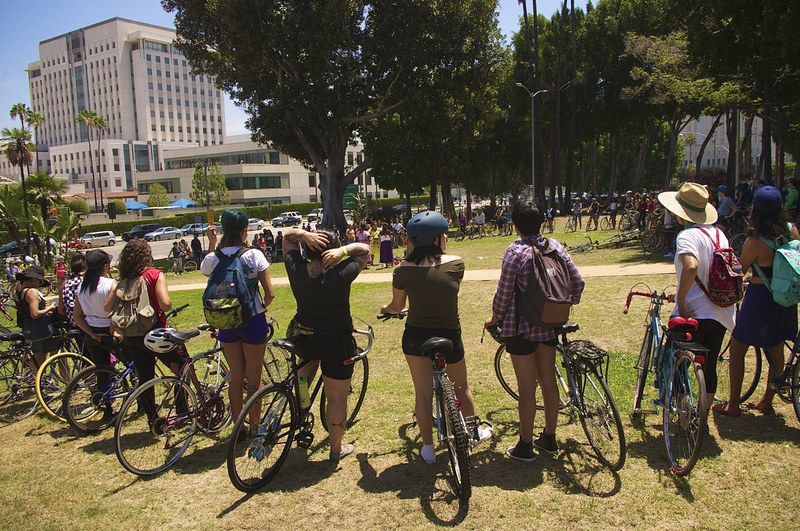 And instead of the world ending, the ride became something of an institution — a day of sisterhood and solidarity around which riders from around the Southland and beyond were willing to adjust their summer schedules so they could be sure to be in town. It even inspired a national movement and, in 2013, saw sister rides spring up in Oakland, Toronto, New York City, Atlanta, and Chicago. Last year’s ride was no different. Hundreds — many of them new to cycling — showed up in the heat to spend a day exploring the city, sharing meals, dancing at pit stops, and engaging in conversations around social justice. Riders circle up for the 2015 Clitoral Mass event. Sahra Sulaiman/Streetsblog L.A. The Ovas’ visibility has helped change stereotypes about who bikes and complicated the conversation around what cycling and, more broadly, accessing the public space, means to different communities. For many urbanists, “reclaiming” the streets means staking out physical space for people with things like pedestrian bump-outs or open streets events. For groups like the Ovas, “reclaiming” space is about shining a light on how the social, cultural, and economic landscapes of a city intersect with the physical one. 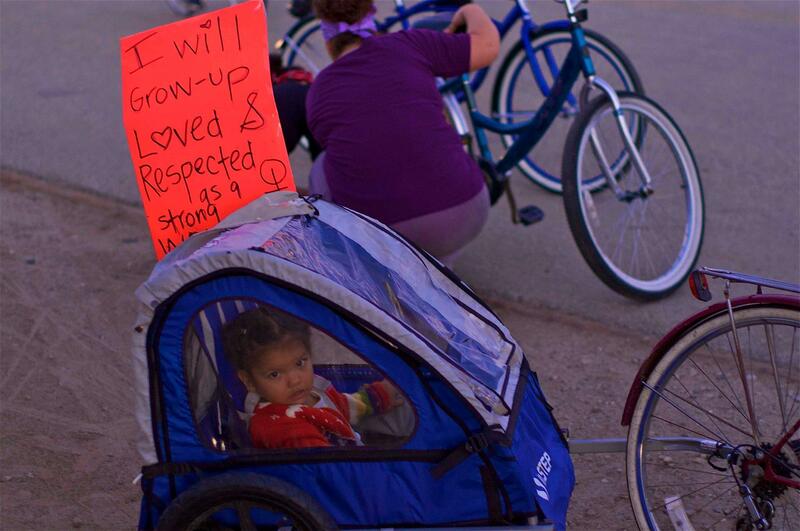 Consequently, their ride events serve as vehicles for advancing social justice, elevating the voices of those on the margins, demanding freedom from harassment by law enforcement (for people of color) and/or misogynists, asserting cultural self-determination, promoting pride in their community, connecting to their heritage, and lending strength and power to other womyn and womyn-identified folks. A bike ride, in other words, is never just a bike ride. “I will grow up to be loved and respected as a strong woman.” From the first Clitoral Mass event. Sahra Sulaiman/Streetsblog L.A. But if there is one thing that has become clear over the years that I have been on the communities beat for Streetsblog, it is that, unless someone comes from an experience of marginalization, it can be hard for them to understand how it impacts every aspect of your life — particularly your movement through the public space — or why finding spaces that validate your voice matter so much. Which is why I have high hopes for the feature documentary the Ovas will debut at SXSW this year. The film follows three of the Ovas — founder Xela de la X, artist Andi Xoch, and newcomer Evie Martinez — as they balance activism and leadership with their obligations to themselves and their families in the context of the working-class Latino community of Boyle Heights. It’s thrilling to know that such an incredible group of womyn will be given a national platform from which to invite people into their lives and journey to forge their own “hybrid form of urban feminism,” as filmmakers Kate Trumbull-Lavalle and Joanna Sokolowski call it. Nerdily, it’s also exciting from a livable streets perspective in that viewers of the urban planning persuasion may be able to see firsthand why and how, for womyn like Xela, Andi, and Evie, truly and equitably reclaiming the streets for everyone requires more than investments in basic infrastructure. The film, according to the Kickstarter page, is just about finished. But filmmakers need funds to finalize the film and take the stars of it to SXSW to speak at the screening. They are about $2,300 from their goal right now, with just under two days of fundraising left. If you’d like to help out, check out their Kickstarter page. If you’d like to learn more about the Ovas, check out their Facebook page, here. *Y con ganas is hard to translate, but “wholeheartedly” might be one literal interpretation. Here, it is meant more to say they are in the fight for the long haul. Good for them. The fire to organize has mostly gone out in #bikeLA. These ladies seem to have found a way to keep it stoked and growing.